I don't love pumpkin. I like most types of squash quite a bit, but pumpkin is kind of overwhelming for me. It usually adds a kind of squishy texture and is often overpowering in most recipes. But as a food blogger, there is always a sort of expectation that you will make seasonally appropriate food, right? Anyway, I had a leftover can of pumpkin from another project I was working on (not for this blog), and was trying to figure out what to do with it. 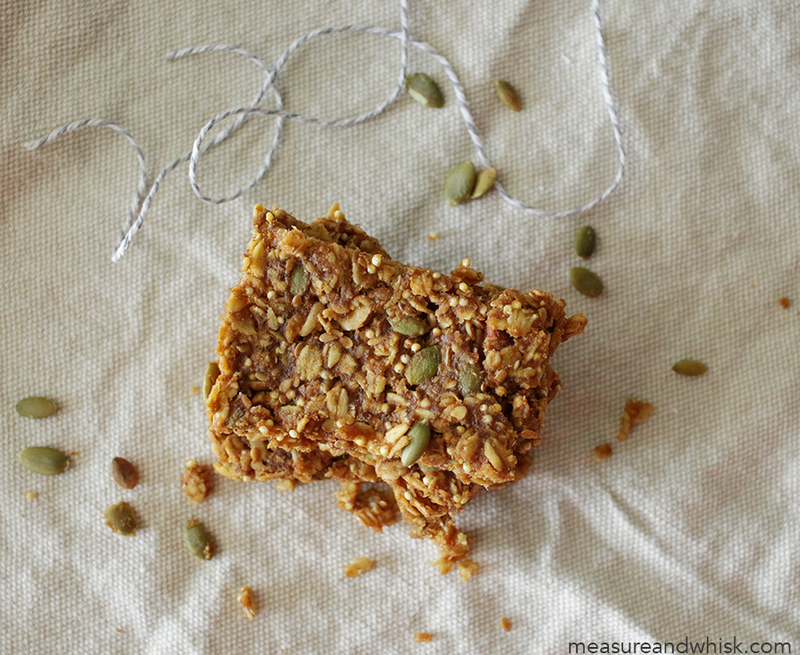 I had been dying to make granola bars again, and this seemed like a great way to do it. The first batch I made was a total fail, so I tried again, this time adding peanut butter. Basically anything tastes great when you add peanut butter (at least in my opinion), and it works fabulously as a binding agent. They were a serious home-run. You may not have all these seeds and nuts on hand, and that is fine (although this combination was a perfect mix of crunchy/soft)! 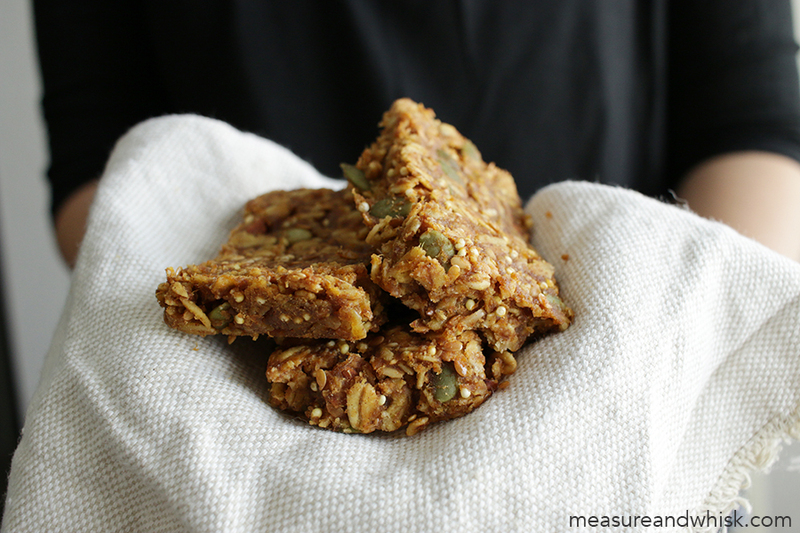 You can sub in other nuts and even use 2 cups of oats to replace all the nuts, if you like. Just keep the ratio of dry to wet the same, so the bars will hold together. I hope you like them as much as we did! Happy Fall! 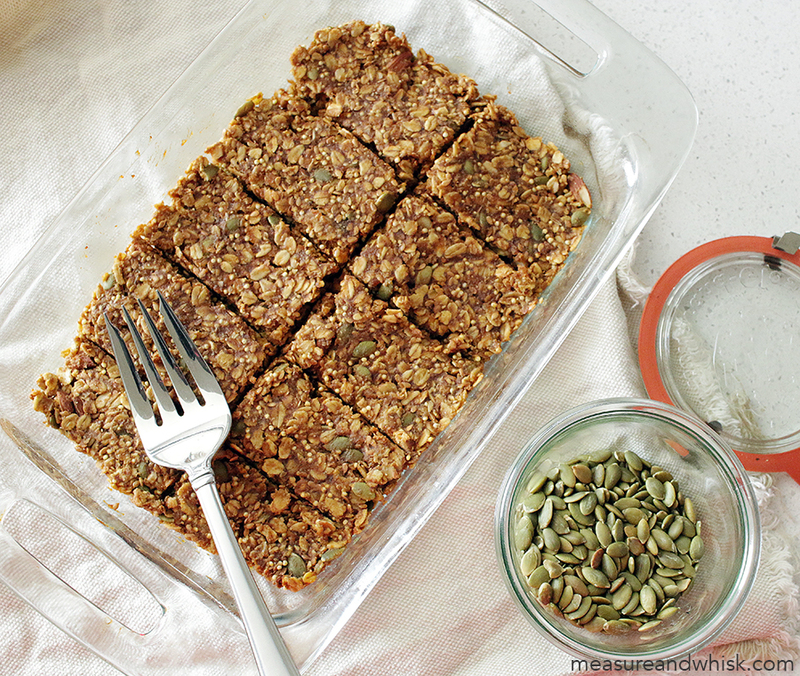 Combine the oats, millet, pepitas, flax seeds, almonds, wheat germ, salt and spices in a bowl. In a larger bowl, combine the pumpkin, peanut butter, honey and brown sugar. Stir until smooth. Add the dry ingredients to the wet ingredients and stir until even distributed, and all the dry ingredients are wet. Pour into a well-greased 8x8 dish or rectangular 2 qt. dish. With a spatula or spoon, mush all the mixture into an even layer. Cook in an oven preheated to 350°F for 20 minutes. Remove when the bars feel a bit spongy and dry. Let cool for 3 minutes, then cut. Let cool another 5 minutes, then remove from the pan. Can be stored in the refrigerator for up to 5 days.